First, we recall that a random walker walks from the past to the present, thus it traverses the Tangle in opposite direction with respect to the direction of the links. Here, our random walker starts from transaction 1, and then transitions to transaction 2. During this transition, the distance covered is obtained by subtracting the ID of the current transaction (2) from the ID of the starting transaction (1), so the result is 2 -1 = 1. 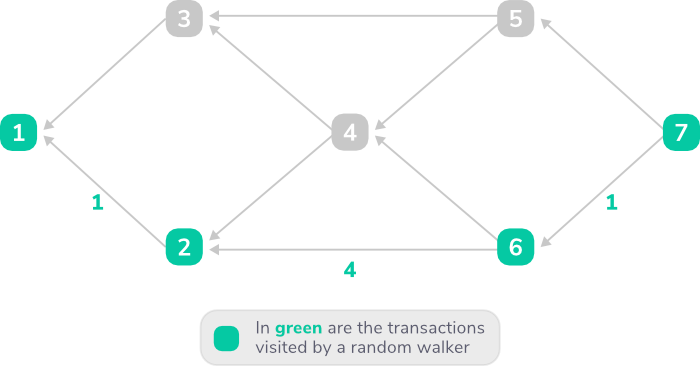 Following its next steps, we can see that during the transition from transactions 2 to 6, and from transactions 6 to 7, the random walker covers a distance of 4 and 1 respectively. Thus, the velocity of our random walker is on average 2 transactions per step. Here, as the previous example, our random walker starts its journey from the transaction with ID 1 and reaches the tip with ID 7. But this time, the random walker chooses a different path. It traverses the Tangle by walking over transactions 1, 3, 4, 5 and 7, covering a distance of 6 transactions over 4 steps, and thus has an average velocity of 1.5 transactions per step. Since the 1-st approver has a smaller ID with respect to the ID of the last approver (i.e., the first approver has been announced to the network before the last approver), values of both distance covered and velocity of our random walker transitioning from x to the first approver will be smaller than if transitioning from x to the last approver. For all the transactions, we also measure the distance between each transaction and its direct approvers. We then plot the probability density function (PDF) that you can see in the following figure. Here, we show the PDF of the velocity. Data points have been normalized to units of transactions (i.e., divided by λ). Blue and orange lines are velocities measured when random walkers always advance to the first approver and the last approver respectively. These curves are important because they give us lower and upper bound on velocities. The green curve is the velocity of a URW, and it is the one answering our previous question. Last but not least, the red dotted line is the distance between each transaction and its direct approvers. It gives us information on the structure of the Tangle. More specifically, it shows the probability distribution of how long the links connecting two transactions are. We have seen what the velocity of random walkers is in the case of an unbiased walk, corresponding to α=0. Now, we can have a look at the average velocities of biased random walkers for different values of α. For this experiment, we consider several Tangles, each one built with different values of both α and the incoming transaction rate λ. We then measure average distance and velocity. Here, we can see the average distance (on the left) and velocity (on the right) as a function of λ. The plots show x-axis in logarithmic scale. The average of both distance and velocity decreases when increasing α and λ values. This result depends on the impact that both α and λ have on the structure of the Tangle. The bigger the parameter α, the more likely random walkers are to transition to transactions with higher cumulative weight. Moreover, as discussed in our blog post on direct approvers, a change of α results in a change of the number of direct approvers, thus suggesting a higher probability of having links within a shorter distance. Similarly, by increasing λ, more transactions are announced within the same time unit h, resulting in a higher probability of creating links with shorter distances. Knowing how long and how fast (or slow) our random walkers run can be very useful when doing analytical approximations of the parasite chain attack. It is also useful when slicing the Tangle into groups of consecutive transactions so that each random walker passes through approximately one transaction from each slice. Moreover, it can help to better understand how the computational effort of performing random walks is spread. Can we find an analytical formula that describes the PDF of the velocity? How does the velocity change if random walkers walk in backward direction (i.e., from present to past)? This could be useful, for example, when considering the case of random walkers stepping back if a transaction doesn’t fulfill a given condition. Is there a relation between the probability for a tip to be left behind (i.e., becoming a permanent tip) and the velocity? We will work on these questions as well as on the relation between velocity and the parasite chain attack. In the meantime, you are all very welcome to ask questions and discuss this topic here or in our Discord channel #tanglemath.